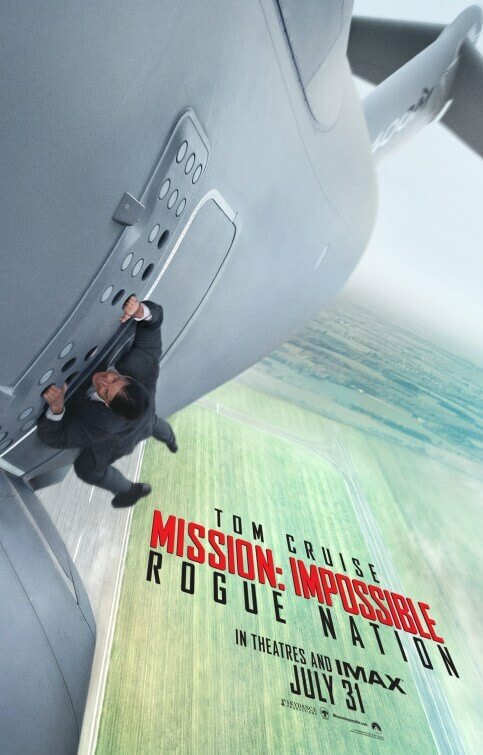 You’ve all seen the trailers and posters for this film, and all of them at one point have put front and centre the image of Tom Cruise hanging on to the side of a plane in mid-air for dear life. Like many of Cruise’s stunt-heavy roles, he not only did it himself but also did it practically; there’s even a handy behind-the-scenes video that proves this, showing that a plane really did take off with Cruise hanging on to the outer door. Don’t believe us? Then feel free to watch below. That, ladies and gentlemen, is the OPENING of Mission: Impossible – Rogue Nation. You may think that it’s pretty damn hard – and, dare we say, impossible – for the rest of the film to top that ballsy stunt, but you’d be honestly surprised at how entertaining it becomes, perhaps even more so than the opening ten minutes. Yes, believe it or not, there are thrills in this movie that surpass Tom Cruise hanging on to the side of a plane with virtually no CG work whatsoever. Cruise is back as Ethan Hunt, that slick IMF agent who this time is on the, erm, hunt for a shady organisation known as the Syndicate – think SPECTRE, but with more stunt work – and expose them before they do any further damage. At the same time, however, the IMF is successfully dissolved by Alec Baldwin’s dastardly CIA director, which forces Hunt and his associates including tech guy Benji (Simon Pegg) and former field agents William Brandt (Jeremy Renner) and Luther Stickell (Ving Rhames) to carry out the mission on their own terms. Along the way, their paths cross with a woman named Ilsa (Rebecca Ferguson), whose loyalties remain as questionable as [insert Scientology joke here – thanks, lawyers]. What makes this fifth instalment work on the thrill factor is the sheer simplicity of it which, in a film as twisty and convoluted as it can be, is a welcome sigh of relief when you can easily piece together what is going on. This is mostly down to writer-director Christopher McQuarrie – his second consecutive film with Cruise after Jack Reacher – who paces the film in a way that feels rather old-fashioned like some of the best spy thrillers can be. Each set piece has this grand sense of passion to how it’s being executed, most notably an assassination attempt at a Vienna opera house which replaces a traditional action movie score with the vocalisations of the Nessun Dorma aria to a rather powerful effect, and even taking that out of it there’s some strong stunt work, gorgeous visuals and some actual sense of what’s going on (so rarely does the film resort to the shaky-cam technique in these sequences, meaning we can actually see the action instead of just blurs of it). McQuarrie brings a sense of style that feels closer to the original 60s TV show than any of the franchise’s previous directors could bring it, and is all the more better for it. Cruise is Cruise, and he does that job well enough; everyone else contributes well too, including Simon Pegg whose expanded comic relief role isn’t as graining as you might expect, although Ving Rhames – the only other actor to appear in all five films – probably isn’t given as much to do as his fellow co-stars, but he’s Ving Rhames so that’s a free pass. Managing to steal the thunder, however, is Rebecca Ferguson as who has to simply be the best female character to have graced a Mission: Impossible film thus far. Like Charlize Theron in Mad Max: Fury Road, the fact that she is female seems to be entirely incidental and never defines her (despite the odd bit of obvious eye candy every now and then), in some scenes even proving to be a perfectly able counterpart to Cruise. She will inevitably remind many people of legendary film star Ingrid Bergman (least of all because of their similar looks and the fact that both are natives of Sweden), and after her breakout role in this film seems destined for a career almost identical to the late Oscar winner. The action scenes, of course, are extremely fun to watch and highly entertaining even as it goes from set piece to set piece (we haven’t even mentioned the underwater heist or the car-then-motorcycle chase in Casablanca, Morocco), and though things are dialled down significantly for the third act, set in London and involving the British Prime Minister (Tom Hollander) in ways we’d prefer not to spoil, there’s still a passion in its execution that makes it an extremely satisfying watch. Many of them, like that opening plane ride, are done as much as possible without the support of CG effects – though we’re still a little iffy on that underwater segment – which is what makes them even more tense and thrilling. At 130 minutes, it is perhaps a bit too longer than it needs to be, and there are a number of plot elements that seem all too familiar from previous instalments as well as other spy thrillers – perhaps it was a wise move to lift it from its original Christmas release date, where a similarly-plotted SPECTRE might have stolen its thunder a little bit – but honestly, that doesn’t matter: you’re having too much fun to notice the obvious flaws in Mission: Impossible – Rogue Nation, which makes the impossible (in this case, not at all caring about logic and consistent storytelling) a little more probable. Mission: Impossible – Rogue Nation consistently finds ways to outdo its thrilling opening, and mostly succeeds; with highly entertaining action set-pieces and a talented cast and crew, including breakout star Rebecca Ferguson and writer-director Christopher McQuarrie, this is a franchise that looks set to cruise along for a good long while yet.